Christopher Williams often examines the crucial role of photography, photographic processes, and institutional archives in our interpretation of current events and historical narratives. For this work, Williams creates an homage to two deceased artists who are important to his own thinking: Bas Jan Ader and Christopher D'Arcangelo. Both were conceptual artists active in the 1970s whose commitment to the reduction of visual information and propensity to make artworks that were ephemeral or even invisible was radical in its own way. Like Williams's work, theirs was as political as it was aesthetic. The tabletop setting and the raking light in the photograph evoke sixteenth- and seventeenth-century Dutch still-life paintings, which, as a Dutch artist, Ader repeatedly referenced in his work. The wall built specifically for the photograph is a nod to D'Arcangelo, who turned his job in construction into an artwork, commenting on the necessity of trading labor for money in a capitalist economy. In one of the few exhibitions of his brief career, his only contribution was to refurbish the walls of the exhibition space. By naming these artists and implicating them in his work, Williams recuperates their legacies, draws out their influence on his practice, and simultaneously traces and writes a history in which art and politics are inseparable. 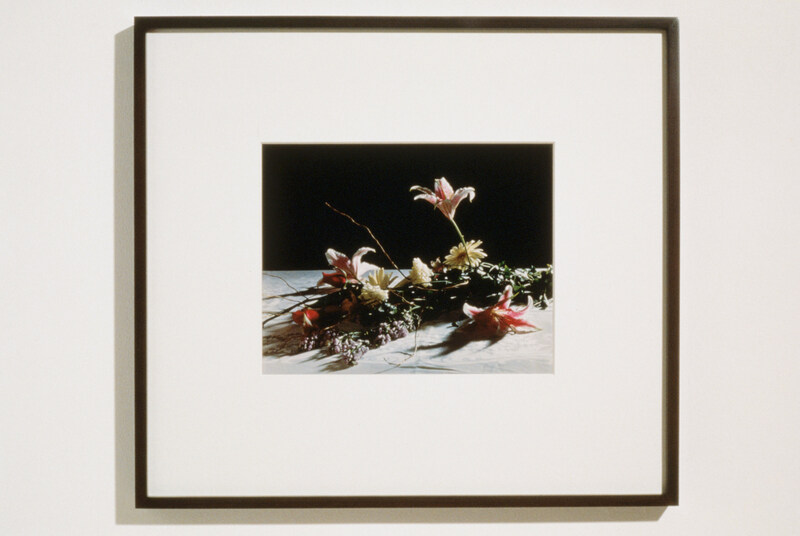 "Bouquet, for Bas Jan Ader and Christopher D'Arcangelo." Take It or Leave It: Institution, Image, Ideology Digital Archive. Los Angeles: Hammer Museum, 2017. https://​hammer.ucla.edu/​take-it-or-leave-it/​art/​bouquet-for-bas-jan-ader-and-christopher-darcangelo/​.